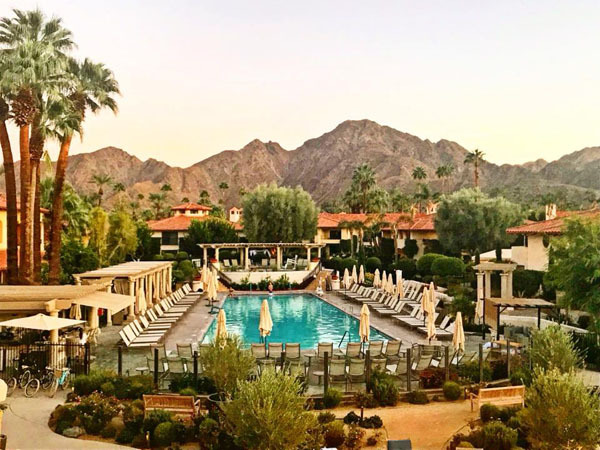 Just a few hour drive from Los Angeles in the new convertible Buick Cascada, we changed up our Malibu ocean views for a relaxing blissful desert weekend in the Palm Springs Valley to celebrate our recent marriage. Due to my husband’s hectic work days, he couldn’t wait for a restful mini ‘moon’ without a schedule. 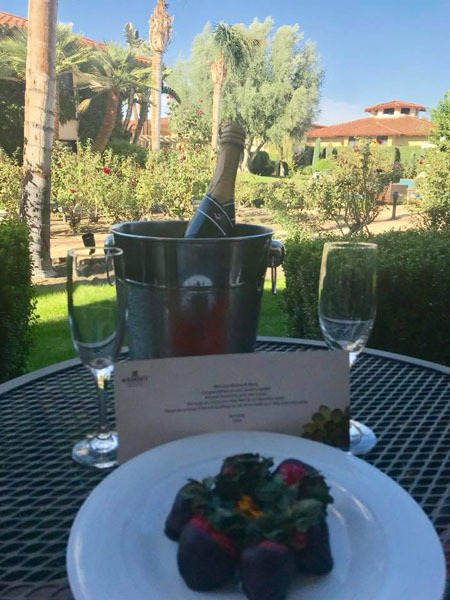 Miramonte Indian Wells Resort & Spa delivered just that! This luxurious hotel was different than other boutique properties we stayed at previously in the Palm Springs area because of the unique setting in prestigious Indian Wells lying at the foothills of the Santa Rosa Mountains. A quick walk through the modern, sleek lobby past a chic bar and indoor outdoor restaurant brought us to a postcard scene of palm trees poking the impressive mountains hugging the property. The 215 guest rooms, suites, and two-story villas with grand archways are woven into 11 acres of olive trees, citrus groves, rose, herb, and vegetable gardens. To start our Friday evening, we toasted champagne with chocolate covered strawberries at our hotel room’s private garden patio. Nearby, an outdoor fire pit could be used for chilly desert nights. Climbing to the second story terrace above the restaurant proved to be the most scenic way to gaze admiringly at the skyline’s surreal hues as the sun set against the jagged mountains. Roses, citrus trees, and pink bougainvillea set the stage for butterflies and hummingbirds to greet us while we dined outside on the patio at Citrus & Palm. Chef Paul Hancock showed us how he crafts unique and unexpected pairings to delight the taste buds. Every meal was created with exceptional ingredients, many straight from their own citrus and herb gardens. We couldn’t decide what dinner course we adored more, from lobster salad with grapefruit and avocado, to a generous portion of fresh creamy burrata and heirloom tomatoes, to chicken liver pate toast to start. 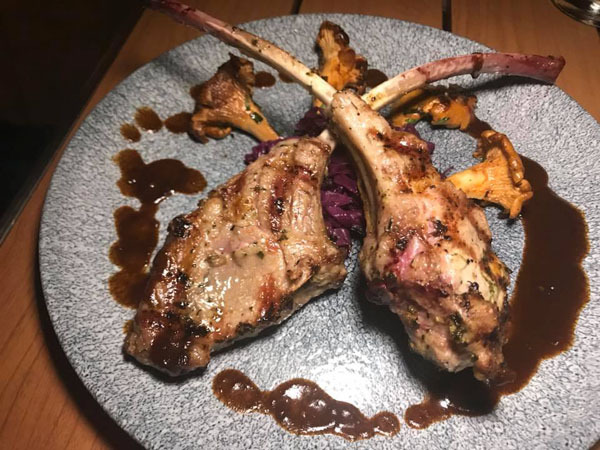 Seafood stew in a saffron broth along with their popular Mangalitsa pork chop (the Kobe beef of pork) with chanterelle mushrooms made us realize there was really no reason to actually venture out of Indian Wells. Cocktails like the Tequila Pineapple Aloe Spice and a Cabernet from Sequoia Grove, Napa were a favorable way to toast “us” and our life together under the desert stars. In the morning, we were excited to dine again at the outdoor terrace at Citrus & Palm where fresh juice and locally roasted coffee pots started our morning over lemon ricotta pancakes, avocado toast with an egg on top, and pumpkin seed crusted French toast. Lunch offered the same fresh high quality ingredients sourced from the Coachella Valley’s organic farms such as dishes like seared tuna salad, stir fried snap peas, and a grain bowl filled with buckwheat, butternut squash, broccoli, kale, red quinoa, and currents. The date shake with toasted coconut captured my attention since the dates come from a nearby farm. It did not disappoint! The drink tasted almost like a milkshake dessert! Our Saturday indulgences took us to the award winning Well Spa where we began with a lavender steam sauna, then a “Painting Party” for two. We were presented with two types of mud made from volcanic clay and rose petals. 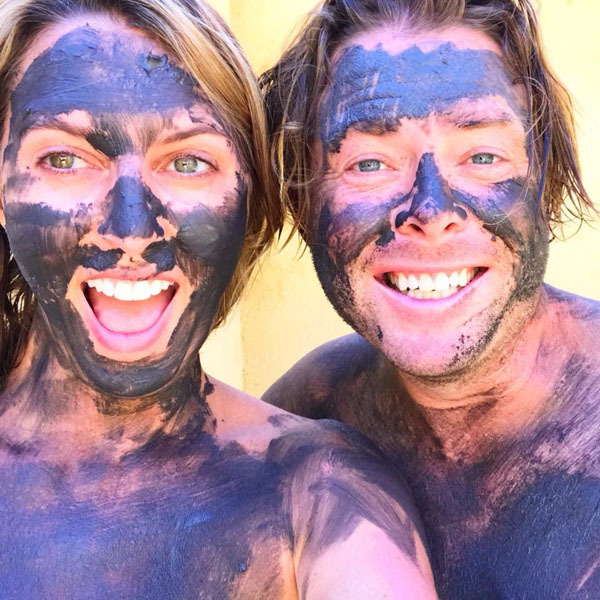 For 45 minutes we painted each other in the buff (first black, then pink) with various paintbrushes, carefully cleansing and rubbing each other in the outdoor shower after the clay had dried. Not often do you have this unhurried time of careful tending to one other, almost like an animal tending to its baby. Champagne bubbly and a skillful dual massage followed this personal pampering treatment session where we felt like melted butter with all our old body aches gone. Oh la la! Afterwards, we found solace in the spa’s quieter pool to lounge and read magazines. In the late afternoon when the crowds and noise died down at the large pool (most likely due to guests getting ready for wedding party obligations), we ventured to our private cabana. However, there is another quiet pool on site with no kids allowed too. Our cabana kept us cool with personal misters while curtain flaps could be draped for more privacy. For a little over $200, the cabana includes a $50 food credit, a fruit bowl and cheese plate, a pitcher of sangria, unlimited water and soft drinks, and attentive service. My new husband was truly teaching me the art of doing nothing. Find your Zen at Miramonte, your personal sanctuary in the desert.